I haven’t spoken Hebrew for almost 30 years. We are in Israel right now and I can’t help myself wanting to throw out some evrit. It is amazing what the brain retains. I was sitting at the bar with David in tel aviv and I needed a napkin. I remembered the word mapeet immediately. I wish I could remember more important things in my daily life. 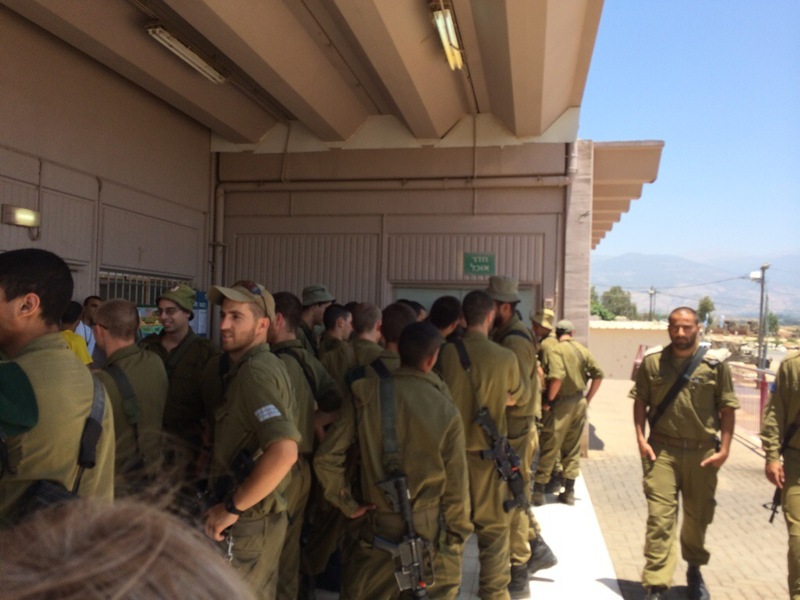 Today we were fortunate to be able to visit an army base on the Israeli/Lebanon border. The soldiers let us climb on the tanks check out their guns and then we are lunch with them in the chadar ochel, food hall. We all spread out and mixed with the 18-21 yr old soldiers. I sat with the girls. It was really nice to talk and ask questions. The word chadar ochel is meaningful to me because we are there 3x a day at camp ramah. Today a new association. Once again I am enjoying following your travels. חדר אוכל resonates with me, too. So cool, thank you for sharing your experiences. Beth, Thank you for posting the blogs so I can see and share in your excitement. I saw the pictures of the children and the soldiers and my heart breaks at the thought of who may or may not make it to adulthood through no fault of their own. It really hit home the difference in the culture between Israel and home. Thank you also for posting the pictures from Ceasarea… I loved Brett looking at the artifacts. History is awesome! If we don’t know where we come from we will never understand where we are going. lol! Walk with peace and know that until i see you post that you are all home and safe I will pray without ceasing for you all. Have you thought about what we back here in PA might give Bennett for this tremendously special occasion? I am so proud of all that you and David encourage the boys to do. They will truly be men to be admired. i did appreciate that you had said I could join you all on this journey and see the Holy Land from both my Jewish and Christian heritage and even though it was not possible now, someday that will be a trip I make and maybe when that day comes you could return too as my guide lol! You mom looks wonderful and if you don’t mind my asking, who is Mimi? from her posts on your fb page, i thought she was younger. Take care and if you could let me know what time Bennett will be standing in temple, I would love to be praying with him here. I can only imagine the pride you and David will be feeling, much like Mary and Joseph when their son stood in the temple with the priests and elders…..
Stella. The bar mitzvah is Monday at 8:00am. You are 8 hrs behind us.